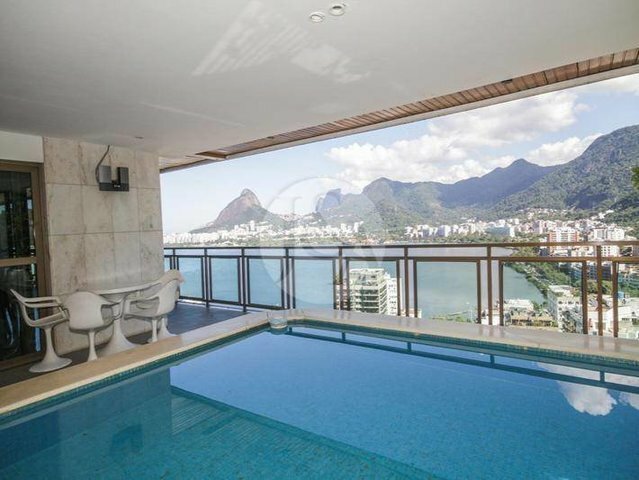 Apartment with exuberant Rodrigo de Freitas Lagoon and Corcovado green views. This originally four bedroom property has air conditioning in all rooms, which are currently divided into entrance hall, large living and dining rooms, wine cellar, study room, verandah, half bath, family room, four en suite bedrooms (the master one featuring a verandah), closet, restroom with a closet, kitchen and eating area with closets, service area, three staff's quarters with a bath. Cozy terrace with swimming pool, steam sauna and bathroom. Parking space for four cars. Condominium has playground.